With its extraordinarily long wings and deeply forked tail, the magnificent frigatebird is unmistakable when seen in flight. The massive wingspan enables the magnificent frigatebird to soar effortlessly, and make graceful aerial manoeuvres, which so captivated Charles Darwin that he dubbed this species “the condor of the ocean”. Frigatebirds are the only seabird family that have obvious, significant differences in plumage between the sexes. The male magnificent frigatebird has entirely black plumage, glossed green on the head and purple on the upperwings and back, and possesses a bare patch of skin on the lower neck, known as the gular sac. This sac can be inflated into a bright red balloon-like organ, which is used to attract females during courtship, while outside the breeding season, the patch fades to orange and becomes barely visible. The female magnificent frigatebird is larger than the male, lacks a gular sac, and has less glossy, brownish-black plumage, with a white patch across the breast and upper belly, three white lines on the underwing and a diagonal off-white line running along the upper wing. Juveniles resemble the adult female, except for the head, which is entirely white. While perfectly adapted for magnificent flight manoeuvres, the magnificent frigatebird does less well on land and sea. It has short legs and very small feet, causing its movements on land to be somewhat awkward; moreover, the plumage lacks a waterproof coating, hence the bird becomes waterlogged and can’t fly if it sits on the water for more than a minute or two. Frigatebirds are remarkable for being capable of staying in flight for extended periods covering several days and nights, and may sleep while on the wing. Like other frigatebirds, this species uses thermals to soar to heights of up to 2,500 metres, gliding downwards and climbing again in succession, with little need for wing flapping. This effortless flight allows long distances to be covered with minimal energetic cost, enabling the magnificent frigatebird to survive over tropical waters where food is scarce. The lack of waterproof plumage means that this species obtains most of its prey either just above, floating on, or submerged a few centimetres below the water surface. As such, its main source of prey is airborne flying fish, but it also takes squid, jellyfish and scraps discarded by boats, and will often feed over tuna and other predatory fish that drive smaller fish species to the surface. 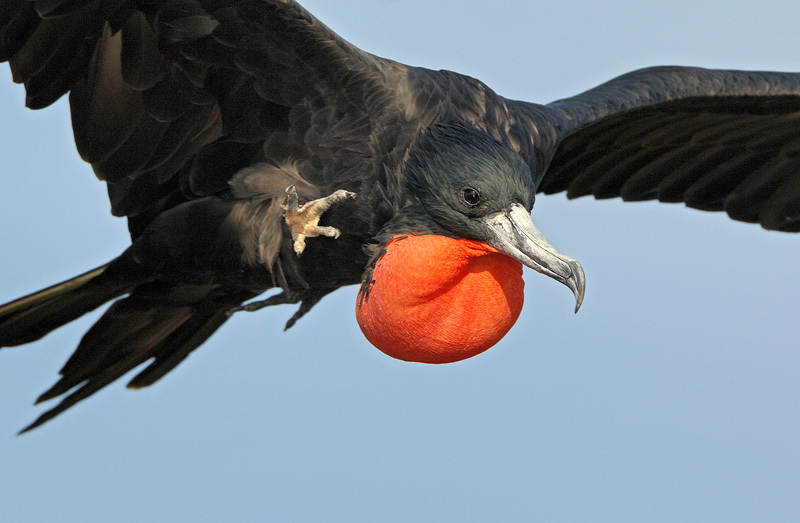 In addition to catching prey, the magnificent frigatebird will sometimes harass other bird species on the wing, forcing them to release food that they have recently caught, which is then snatched from mid-air by this species before it reaches the water. When not airborne, the magnificent frigatebird perches in trees, bushes or, less preferably, on the ground. A gregarious species, roosting takes place in large groups, where, during the day, individuals display a remarkable sunning posture, involving sitting upright with the wings fully extended to the sides, exposing the chest and underwings to the sun. The breeding behaviour of the magnificent frigatebird is highly unusual and dramatic. During courtship (which generally occurs between August and October), the males gather in groups of various sizes, with gular sacs inflated, bills clattering, and wings and heads waving, while making calls to attract females flying overhead. Once a pair decides to mate, they commence construction of a nest, usually in a tree or bush, with the male providing material such as twigs, while the female does the actual building. After mating, a single egg is laid, which is incubated for between 53 and 61 days by both parent birds. The chick, which takes around 22 weeks to fledge, is brooded and fed by both sexes for the first seven to twelve weeks, after which time the male leaves, and the female assumes full responsibility for raising the chick, providing food until fully fledged, and then for a further four to nine months. This extended period of parental care exhibited by all frigatebirds is the longest of all birds, and means that the female can only breed in alternate years. In contrast, by abandoning parental duties relatively early on, the male is able to breed with a new partner each year. Frigatebirds are the only seabirds known in which the sexes breed on cycles of different lengths. The breeding range of the magnificent frigatebird encompasses islands throughout the Caribbean, tropical areas along the Pacific and Atlantic coasts of Middle and South America, and the Galapagos Islands. Outside the breeding season, this species’ range is even more expansive, with individuals regularly found along the Pacific coast from central California, south to northern Peru, and along the Atlantic coast from North Carolina, south to northern Argentina. During storms, magnificent frigatebird individuals may be blown exceptionally long distances off course, and have been spotted as far north as Alaska and Canada, and as far east as the Cape Verde Islands, the west coast of Africa, and even Great Britain, the Netherlands, and Denmark. 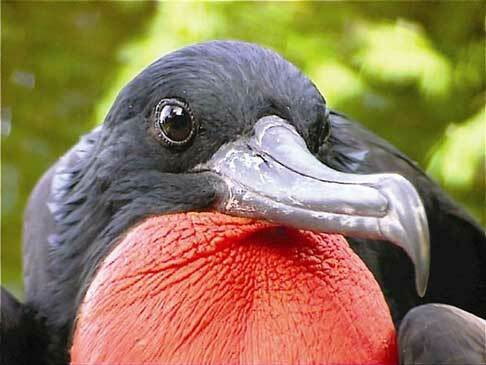 The magnificent frigatebird breeds in stands of mangroves on coral reefs, and amongst deciduous trees and bushes on dry islands and along coasts. During breeding, foraging may take place over shallow water within lagoons and coral reefs, or over deep ocean. Outside the breeding season, this species can usually be found over warm coastal and offshore waters, and roosts in trees on tropical and subtropical coasts and islands. The magnificent frigatebird has a relatively large population and is not currently considered to be globally threatened. Nevertheless, as a result of human disturbance, habitat loss and the introduction of non-native predators, several historic colonies have been wiped out. Losses have been most severe in the Caribbean, where an estimated 50 percent of the colonies have been destroyed. In addition, the magnificent frigatebird’s heavy reliance on food brought to the surface by underwater predators such as dolphin and tuna, which are themselves being driven to extinction, could have serious consequences for this species. 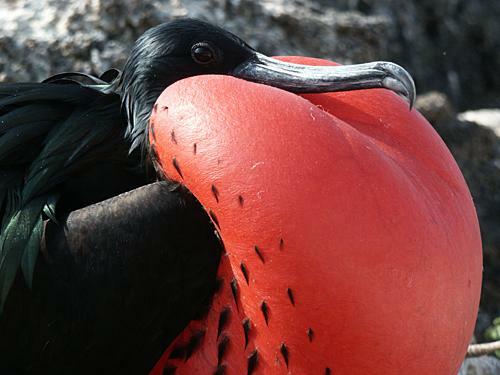 While many magnificent frigatebird colonies are protected by written laws, they are rarely enforced. A lack of funds means that the colonies are not patrolled, and there is no method to punish people breaking the law. Improved protection and enforcement of existing laws, particularly in the Caribbean colonies, is therefore necessary to ensure the survival of this remarkable bird.